As the first newly constructed hotel since 2008 in San Francisco, Hotel VIA (138 King St.) seized the opportunity and fully integrated the latest hospitality technologies into the design of the hotel. In harmony with human interaction, Hotel VIA adds approachable yet elevated services aimed to appeal to tech-savvy travelers and traditionalists alike. Located in the South Beach neighborhood across from AT&T Park, the 159-room hotel will open in June 2017. From the moment guests book a reservation, they are sent a link to download a customized mobile concierge app by KEYPR, to determine their needs and plan their stay. The interface offers guests a curated city guide highlighting upcoming events to coincide with their trip, and the opportunity to explore the best of the South Beach neighborhood, order snacks, pillow preferences, and more while on or off property. Upon arrival to Hotel VIA, guests will still have the option to check-in with a team member or choose to bypass the standard check-in desk with their mobile device that serves as a digital room key. Echoing the hotel’s design with a minimalistic, modernized appeal, each guest room is outfitted with ASSA ABLOY Hospitality’s sleek, new VingCard Essence door lock, a keyless lock system that is compatible with the ASSA ABLOY Hospitality Mobile Access solution and technology. 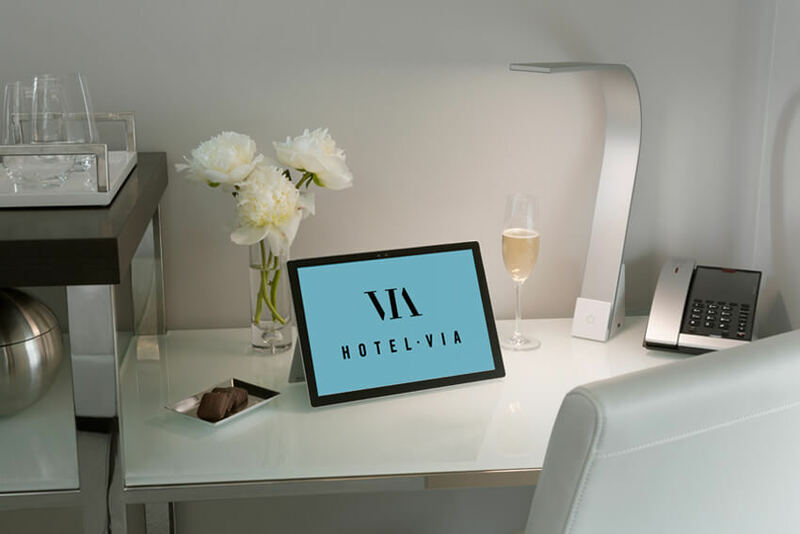 Hotel VIA guest rooms will be equipped with a personal tablet (7”) set up with guest services, promotions, and access to entertainment and news sources, such as The Wall Street Journal, The New York Times, and more. Additional options allow guests to order or schedule room service, discover nearby attractions and happenings, and more. Guests control room temperature preferences though Honeywell’s INNCOM energy management system, which saves energy and guests’ room preferences to activate when they are in the room. To meet the growing technological demands of business and leisure travelers alike, Hotel VIA will offer one of the most robust wireless systems supported by Comcast Business and Fortinet Security Fabric solutions, including wireless access points and switches secured by FortiGate enterprise firewalls and unified access management using Fortinet Connect. Hotel VIA has also implemented FiberLAN from DASAN Zhone Solutions to support a Gigabit Passive Optical Network (GPON). The high-speed POL-based Ethernet solution enables guests to connect to the Internet anytime, anywhere on the hotel property. With this secure and energy-efficient network solution, Hotel VIA guests will be able to connect an unlimited number of devices and have instant access to high-speed data, voice and video without compromising network speed. Additional information regarding each partnership is available upon request.